The legendary CAAMA Radio came and visited QRAM/Black Star, to see for themselves the innovative approach taken by QRAM to provide a modern radio broadcasting service to the remote Queensland services. CAAMA Radio Manager Gerry Lyons, AKA the G-Man and CAAMA CEO Michael Robertson were taken through a presentation about the Black Star Wide Area Network (WAN). by QRAM Engineer Gerry Pyne, who designed the network. 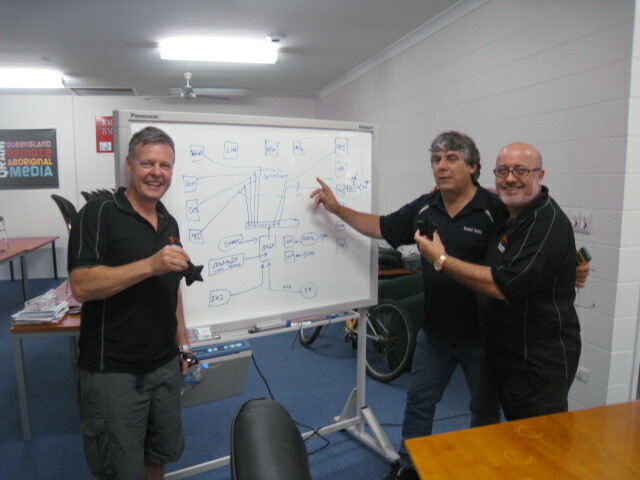 Gerry outlined the design concepts, technology, hardware and software required to set up a comparable network for the CAAMA RIBS service. The CAAMA team were impressed by the technological innovation, the increase in productivity, and the improvements in the service level QRAM is able to provide for the remote communities. Outcomes include that RIMO can save time and expensive costs in long drives to remote communities just to perform simple start-up and maintenance jobs. Many of these can now be done by online access. Training is another area to benefit. Through the WAN service, the hub RIMO is a virtual 2 way highway. The RIBS coordinator can talk to the operator in real-time as they VPN into the station play out system. This not only assists the operators but helps to develop their own IT knowledge and understating. The WAN comes into its own in rainy season. With satellite there can be ‘rain fade’ for long periods, resulting in stop-start radio and TV. With the Black Star delivery by broadband any network content is already delivered to the local play out system in the station and so continues to play uninterrupted. CAAMA were able to witness the Black Star WAN in action. Gilmore Johnson, QRAM Network Coordinator, took them on a virtual tour into each station log on the network. QRAM is the first Indigenous broadcasting service to use technology in this way, linking stations together via fixed and wireless Broadband. CAAMA Radio is a household name across Australia, and many see it as the leader in Indigenous broadcasting. CAAMA was the first Aboriginal radio station in Australia and soon grew into larger media organisation with a music recording studio, music label, film productions, that have won countless awards and the creation of Imparja television. We were proud to have a group from CAAMA visit to see what we are doing, to learn from our ideas and grow them into something better for the Indigenous broadcasting sector in remote Australia.